The low chum run sure made this year’s eagle migration to the upper Skagit a bust. Looking back through historical records, In the 31 years since surveys began, the only year with lower eagle numbers than this one was 1983. That must have been a spectacularly bad chum year! This does not mean that eagles are in trouble at all. The birds we count here in the winter are mostly migratory. Eagles are opportunistic feeders, and will travel to the areas where food is abundant and easily obtained. 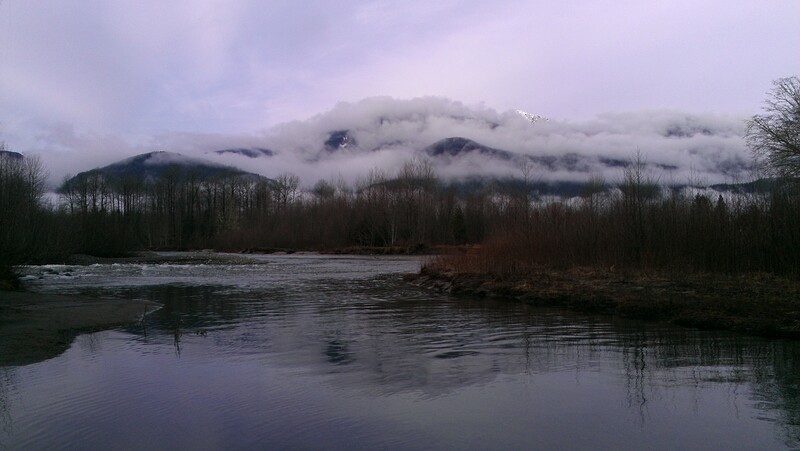 In our local area that appears to be the Skagit and Samish deltas, and the Nooksack River. 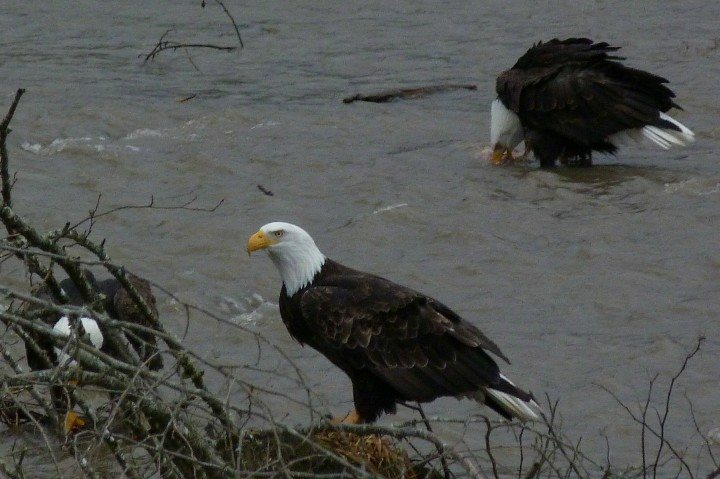 Eagles are clearly finding plentiful fish and gathering in much larger numbers on the Nooksack than on the Skagit right now. My sources in Rockport report nearly constant rain. The forecast is for continued windy conditions overnight and calming by tomorrow. Today’s eagle hotspot was Marblemount Fish Hatchery, which had nine eagles, some quite close to the road — a photographer’s delight! We will be out tomorrow. 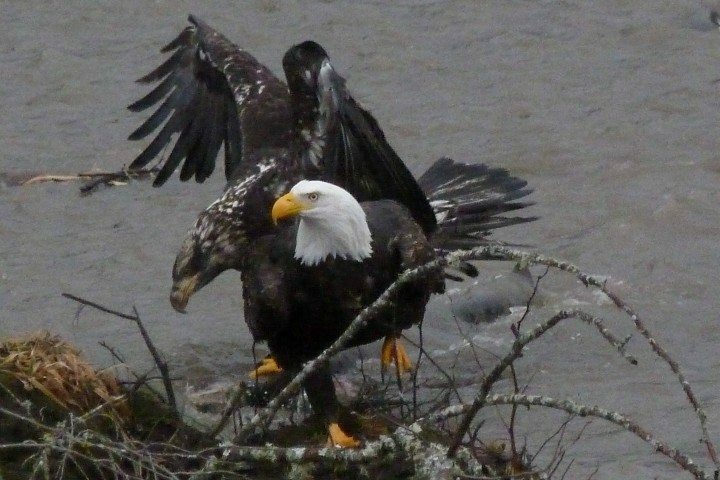 Hello, eaglewatchers and visitors to the Upper Skagit! 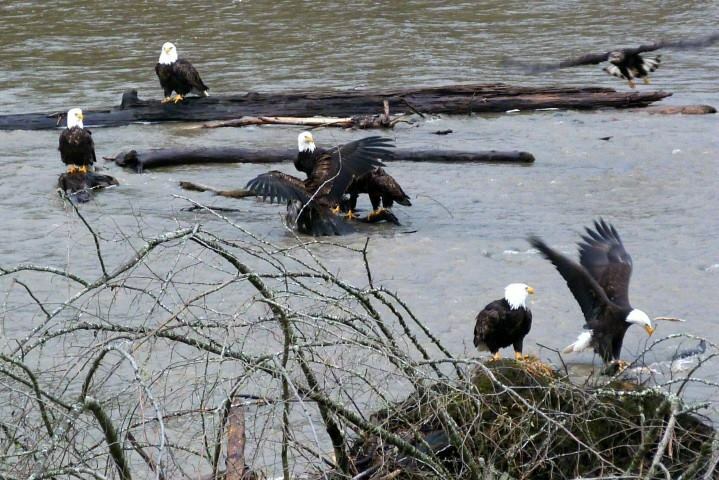 The Skagit Eagle Festival 2014 is on each weekend this month. Local and natural arts & crafts, bake sale, and fry bread tacos. Free admission. Donations warmly received. See ALL the weekend’s activities here. For the latest weather forecast for Rockport Washington, click here. Eagle watcher volunteers and I will be meeting in the morning and setting up our stations and will be out looking for eagles unless we are forced inside due to extreme weather/Seahawks game/lack of interest. During Wednesday’s eagle survey I observed several eagles at Milepost 100 and a few at Howard Miller. Will they be out and about this weekend? I’ll let you know. Why are numbers so low this winter? According to our source at WA Department of Fish and Wildlife, this season’s Skagit River chum run estimate is not in yet, but could possibly be in the 9-10k range. That is worse than both 2012 (36,408) and 2011 (15, 280), both of which were bad years. DFW has escapement goals of 30K in odd years and 100K in even years. The last time that goal was reached on the Skagit was in 2006, with 104,483. In good news, we have lots of Coho this year. It is too early to say yet, but numbers could be better than last year.